This NASA illustration depicts the STS-121 spacewalkers as they test the stability of Discovery’s orbital boom during their first spacewalk. Twoastronauts are preparing to take at least two strolls in space outside NASA'sDiscovery shuttle after it launches into orbit Saturday. STS-121spacewalkers PiersSellers and MichaelFossum are charged with some vital tasks duringtheir 12-day spaceflight, not the least of which is making pivotalrepairs that will make or break the future of the International SpaceStation (ISS). A mix ofexperience and enthusiasm, Discovery's spacewalking team will test heat shieldrepair methods and fix a vital cable reel on the space station's Mobile BaseTransporter - a railcar that is vital for ISS construction. "It's beenabout two years of pretty hard work," Sellers said of his mission training in aprelaunch interview. Discovery'sSTS-121 mission is slated to launch at just past 3:48 p.m. EDT (1948 GMT) on July 1 on NASA'ssecond shuttle flight since the 2003 Columbia tragedy. STS-121pilot Mark Kelly will assist Sellers and Fossum frominside Discovery, NASA officials said. 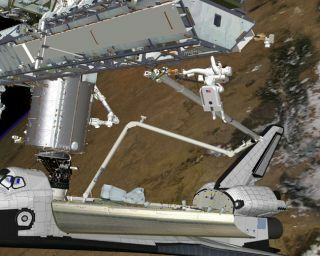 The pair could make an additionalspacewalk if orbiter resources allow. A veteranof one shuttle flight and three spacewalks, Sellers is by far considered the funnymanof the STS-121 mission by his crewmates and will lead the spaceflight'smultiple spacewalks. "We allmake fun of each other," said Sellers, 51, adding that humor can break tensionduring training. "You have to think of training as a marathon, it goes on formany months, and then you get a slip and sometimes if can feel like it'sgetting frustrating. And then you feel like laughing." A native ofCrowborough, Sussex in the United Kingdom, Sellers joined NASA's astronautcorps in 1996 and flew aboard the Atlantis shuttle during its ISS-bound STS-112mission in 2002. "It's greatjust to sit there and think about where you are," Sellers said of shuttleflights. "And think, this is a remarkable place to bewith the world spinning through space below you, and you in this little shipfloating around it." Sellers, who is married and has two grown children, will ride at the end of Discovery's50-foot (15-meter) orbital boom during the first STS-121 spacewalk to check itsstability as a work platform for heat shield repair. He and Fossumwill then repair the Mobile Base Transporter's cable reel system. "As long as[it] can move up and down, we can build the space station. Right now it'sbroken and we're going to try to fix it," Sellers said of the complicated task. "It's not a sure thing by any means." A thirdspacewalk, to check a series of heat shield repair techniques, will likely beadded later in the mission, the experienced spacewalker said. "I would bevery surprised if we didn't do it," Sellers said, adding that Discovery'scryogenic fuels should be ample enough to support the third spacewalk unlessthe orbiter is stuck on the launch pad for several days for some reason. "Thatwould require some bad luck." AidingSellers in the STS-121 spacewalk is Michael Fossum,48, who will make his spaceflight debut with Discovery's planned July 1 launch. "I love thespace business," said Fossum, who grew up in McAllen, Texas, in a preflight interview. "Iwanted to be part of it one way or another." A formerU.S. Air Force test pilot and colonel in the USAF Reserves, Fossumjoined NASA in 1993 - five years before he became an astronaut - to test thepotential of Russian Soyuz spacecraft for use on the ISS. He helped in an ISSredesign and later served as a flight test engineer on NASA's X-38 spacestation crew escape vehicle. Fossum,who is raising four children with his wife Melanie, considers his spaceflightanother notch in his family history, which has been packed with explorers sincehis first ancestors came to the U.S. from Norway, Ireland and Germany more than 130 years ago. "It'sreally a large part of what makes me who I am," Fossumsaid. "The romantic in me likes to think that I'm living just a little fractionof that life." OutsideNASA, Fossum holds scouting high on his list ofactivities and is himself an Eagle Scout from his days with the Boy Scouts ofAmerica. "I knowthat it has changed my life in many significant ways and...I like the opportunitynow to help work with the kids," Fossum said in aNASA interview, adding that his troop has given him some gruff about missingthis summer's major camping trip. "The guys give me a hard time, telling me I'mgoing to be missing next summer's High Adventure activity because I'm workingon another one for NASA." Despite thebusy schedule facing the STS-121 astronaut, Fossumhopes for a free moment to absorb the feat he and his crewmates areaccomplishing. "I hope tohave a few minutes just to appreciate the opportunity that I've got," Fossum said. "To have it sink in without having to rush tothe next task." Robert Z.Pearlman contributed to this story.